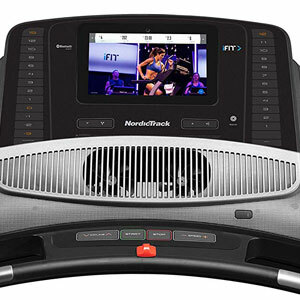 NordicTrack has released several versions of the 1750 treadmill over the years. The latest version for 2019 is the NTL14119. As the title suggests, it’s a commercial-grade machine featuring a heavy-duty construction, a powerful motor, and an advanced touchscreen console. Just as the NordicTrack T 9.5 S that we’ve previously reviewed here, the 1750 model comes with an iFit membership for one year. The NordicTrack Commercial 1750 features a heavy-duty steel frame construction with a sturdy base and two thick ovalized front masts. Of course, the unit also has several ABS or non-metallic parts, but these only have a protective role. Among them, we can count the side rail covers (which are also rubberized), the front base covers, several other small covers, the dashboard that sustains the console, and the accessory tray that connects the two front masts. 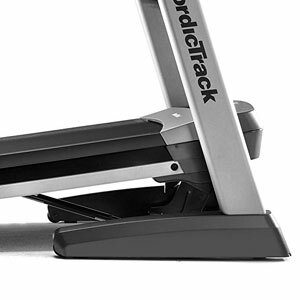 Just as any other heavy-duty treadmill, the NordicTrack 1750 is quite heavy. Its exact weight is not specified, but it is definitely heavier than 250 lbs (113 kg). All this weight delivers an outstanding stability. But on the other hand, its transport and assembly require at least two people. Once the unit is assembled, its relocation isn’t too difficult, though. Its front base metallic base features a set of transport wheels which facilitate its relocation. The fully assembled treadmill is fairly large; its footprint is approx. 78.8″ x 39.2″ (200 x 99.5 cm). Plus, it is required to leave at least two feet of clearance on each side of the deck and at least three feet of clearance at the rear of the deck for safe and unhindered usage. The machine has a folding design. The deck can fold up providing better storage possibilities and allowing you to easily vacuum under it. The folding mechanism involves a hydraulic cylinder which slowly unfolds the deck preventing it from crashing on the floor. With the deck folded up, the unit’s depth is reduced to approx. 41″ (104 cm). The NordicTrack 1750 NTL14119 features a very sturdy deck. To begin with, it is rated for a user weight capacity of 300 lbs (136 kg). It uses a multi-ply belt with a rubberized, non-slip top layer. The internal rollers are 2.5″ in diameter and have a crowned design to prolong the lifespan of the belt and provide a superior traction. They also integrate industrial-grade sealed ball bearings for a smooth rotation. The unit’s tread belt provides a running surface of 60″L x 22″W (152.4 x 56 cm). This being said, the running platform is large enough for users up to 6’5″ (196 cm), promoting a satisfying range of motion and a complete stride. 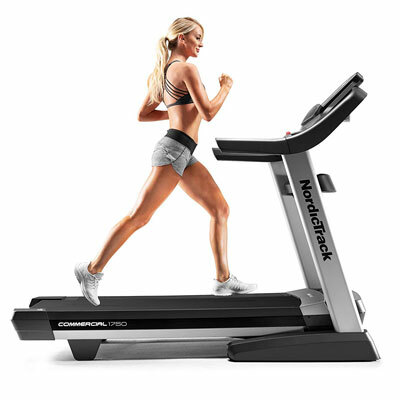 As opposed to other NordicTrack treadmills which have the FlexSelect cushioning system, the 1750 (2019) model is equipped with the Runners Flex™ shock absorption system. The side cushioning elements of the deck are concealed, and the adjustment is done with ease from the dial on the left side of the deck. The dial offers two modes, one for a firmer running platform, the other with more cushioning at the front to absorb the shock of each footstrike, and harder at the back for a better push-off. 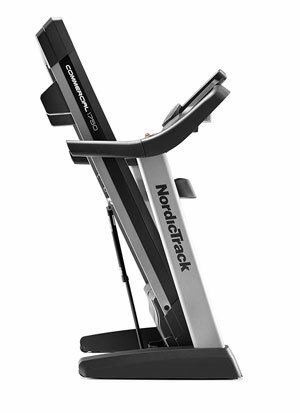 The NordicTrack 1750 (2019) is equipped with a motorized incline/decline system. This means you can adjust the ramp of the deck during your workout from the controls on the console, or, if you’re using one of the onboard programs, the machine will adjust the incline automatically. The treadmill offers 15 levels of incline from 0% to 15%, and 3 levels of decline from -3% to 0%. The incline/decline increments are 1%. There are buttons for quick incline and decline adjustment on the left side of the console display, while the bottom keypad offers buttons for gradual incline adjustment. The step-up height of the deck is approx. 11″ (28 cm). Plus, with the incline set all the way up, the front part of the deck will become elevated by a few extra inches. Therefore, it is recommended to use the machine in a room with a ceiling that is at least 20″ (51 cm) higher than your own height. The NordicTrack Commercial 1750 (2019) is equipped with a 3.75 CHP DurX™ Commercial Plus motor with its own internal cooling system. Needless to say, this prevents it from overheating, so the machine can provide the same peak performance even for the longest workouts. The motor also has a small flywheel which minimized vibration and promotes a very smooth rotating motion for the tread belt. The speed range provided by the machine’s motor is 0.5-12 MPH. Just as for the incline, there are buttons for gradual speed adjustment on the right side of the console display, from 0 to 12. The arrow controls for the gradual speed adjustment are bi-functional. If pressed once, they will adjust speed by 0.1 MPH; if you press and hold a key down, the tread belt’s speed will adjust in increments of 0.5 MPH. The fact that you can adjust speed in increments of 0.1 is quite a plus, as you can easily find the most comfortable pace for your workout. The NordicTrack 1750 (2019) features an advanced console with a 10″ LCD display with LED backlight and integrated touchscreen technology. As opposed to the older version (2017), this one has an HDMI port along with the USB port, so you can connect it to a TV or monitor in order to view the console screen on a larger display if you want. The console is iFit enabled; it also comes with one year of free membership to iFit. This being said, you can access the iFit workout database for more than 16,000 on-demand workouts, run on virtual trails based on real-world locations, and benefit from live interactive training. You can also draw your own map workout, setting up distance, the average amount of calories that you would like to burn, and more. In terms of connectivity, the console has both Bluetooth and Wi-Fi technologies. This being said, you can connect the machine to your home Wi-Fi in order to use the iFit applications. The Bluetooth connectivity stands for the integrated speakers and for HR transmitters. In other words, you can connect your MP3 player or smartphone via Bluetooth to the console in order to play your music through the console speakers, or use and Bluetooth HR chest strap to monitor your pulse. However, for pulse monitoring, there also are sensors integrated into the front handlebar. In case you don’t want to use iFit, the console still has a pretty solid onboard program database. It offers 50 preset programs which cover all types of workouts focusing on weight loss, high-intensity cardio, intervals, stamina development and much more. Also, the console display tracks all the important workout metrics, including time, distance, calories, pulse, speed, and incline. It offers goal settings for time, distance, or the amount of calories that you want to burn. The speed and distance are set by default to imperial units (MPH and miles), but there is also the option of metric units (km/h, km). In terms of other accessories, the console also includes two device holders, two accessory trays, and a set of two workout fans. One of the device holders attaches at the top of the unit, the other is a small shelf right under the display. The workout fans are quite large compared to the ones on other treadmills; they’re placed right under the console display and provide excellent cooling during a more intense workout. 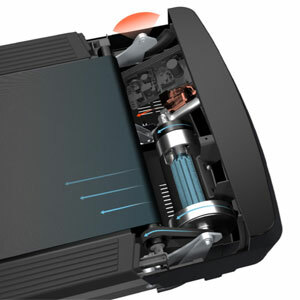 Just as for many other treadmills, the deck of the NordicTrack Commercial 1750 comes fully assembled. This being said, for the assembly task you only need to attach the two front masts, the accessory tray and the dashboard with the console. This shouldn’t take more than an hour. All the assembly instructions are provided into the included manual. All the tools required for the assembly are included as well. The machine’s belt is pre-lubricated, so it shouldn’t require lubrication at least for a while. The running belt should be kept clean, free of dirt, textile fibers or other objects that might be dragged under it and get caught in the motor. Also, it is recommended to periodically inspect the machine for loose bolts and parts. 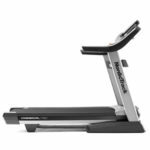 The NordicTrack 1750 (2019) is a commercial-grade treadmill equipped with a 3.75 CHP drive motor, automatic incline/decline, a durable Runners Flex cushioned deck, and large LCD touchscreen console. It is iFit enabled and includes 1-year iFit membership. Thus, you can access the iFit workout database and use the iFit workout applications and progress tracking system. It also has Wi-Fi and Bluetooth connectivity, plus an HDMI and a USB port for cable connections. It’s an excellent machine for users of all levels, for light to intense cardio training, muscle toning, stamina development, and weight loss. And finally, it’s not exactly an affordable fitness machine but definitely offers excellent value for the price.